Treats for all who enter! The MS (Multiple Sclerosis) Ireland coffee morning and plant sale will take place at the MS Ireland National Care Centre, 65 Bushy Park Road on Wednesday 27th May. NB, traffic is likely to be heavy on Bushy Park Road on the day. If you would like to donate items before the fete, you can leave them at War Memorial Hall, Rathfarnham Road, Terenure, from Monday 18th to Thursday 21st May between 7pm and 9pm. 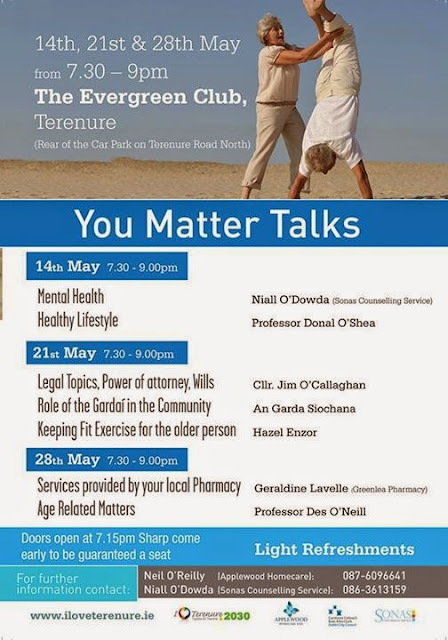 Terenure 2030 in conjunction with Applewood Homecare, Sonas Counselling Services, The Evergreen Club, An Garda Siochana and Dublin City Council, are hosting a series of 3 wellbeing talks titled "You Matter". All talks will be at the Evergreen Centre (rear of car park, Terenure Road North), starting at 7.30pm. Maximum purchase of 5 trays per household, €1.50 per tray. Stock up your baskets, borders and pots with these bargain bulbs! This year's Terenure 5 Mile race will take place on Sunday 17th May starting at 11am. Fortfield Road back to Terenure College. You can view a video of the route and find out more about the race at the website Terenure 5 Mile.